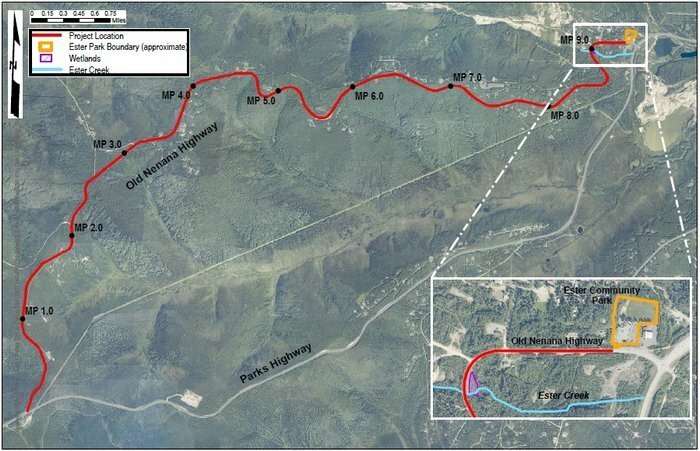 The Alaska Department of Transportation & Public Facilities (ADOT&PF), in cooperation with the Alaska Division of the Federal Highway Administration (FHWA), is proposing to rehabilitate the Old Nenana Highway in Ester, AK between the western Parks Highway intersection (milepoint 0.000) and the Ester Community Park approach (milepoint 9.368). The project has begun construction, with tree clearing occurring Fall of 2017. The remaining roadwork will be completed in 2018, beginning in late April. Open Houses were held December 9, 2015, March 18, 2015, and November 16, 2016 at the Ester Volunteer Fire Department. The ADOT&PF thanks all those who attended and the Ester Volunteer Fire Department for hosting us. Graphics and presentation material from the November 2016 open house are available on the sidebar, as well as an updated Comment Response Summary. Improve safety and reduce maintenance costs on the Old Nenana Highway. Sections 9,10, 11, 12, 16, 17, 20, 29, 32, and Tract B, Township 1 South, Range 3 West, Sections 7 and 8, Township 1 South, Range 2 West, Fairbanks Meridian, USGS Quad Map Fairbanks D3.